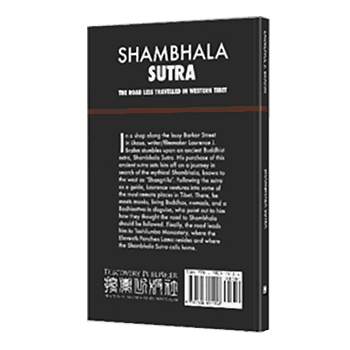 Shambhala Sutra, the second volume of the Himalayan Notes series, presents my 2004 expedition across western Tibet's Ngari region, when I went searching for the mythical kingdom of Shambhala, thinking it might be a physical place. Using an ancient sutra written by the Panchen Lama over two centuries ago as a metaphorical guidebook, he traces a route embedded with riddles through deserts and mountains. Eventually the expedition arrives at the lost kingdom of Guge, now abandoned and in ruins due to an epic war and desertification of once rich pastureland. Our universe is a vast matrix of cause and effect synergies. To change our own path of self-destruction, we must bring compassion, long-term vision, and care for others and the environment into our daily lives and action. We need a fresh economic paradigm, one that calls for compassionate capital, empowering people, and prioritising our environment. Spirituality can be more powerful than materialism. Holistic economics means sustainability of our planet. We all all interconnected with ourselves, and our environment. In the first book of the Himalayan Notes series, Searching for Shangri-la, our 2002 expedition sought to find the mythical paradise described in James Hilton’s classic novel Lost Horizon. We learned that “Shangri-la” is a misspelling of “Shambhala” a core concept of Tibetan Buddhist cosmology. That led us to find Shambhala. Shambhala is a future realm of peace, harmony between man and environment, where those with wealth and health reach out to help those without. It is a future that we can arrive at if we want to get there. It all depends on our intention. It took me many journeys to understand the meaning of Shambhala. 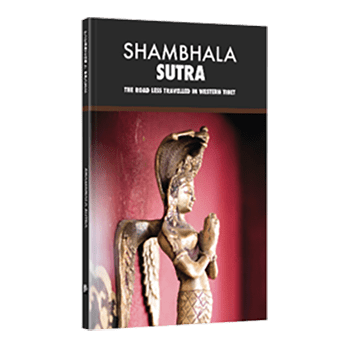 Shambhala Sutra, the second book of the Himalayan Notes series, presents my 2004 expedition across western Tibet’s Ngari region, when I went searching for the mythical kingdom of Shambhala, thinking it might be a physical place. Using an ancient sutra written by the Panchen Lama over two centuries ago as a metaphorical guidebook, he traces a route embedded with riddles through deserts and mountains. Eventually the expedition arrives at the lost kingdom of Guge, now abandoned and in ruins due to an epic war and desertification of once rich pastureland. The discovery is not that Guge is Shambhala. On the contrary, lessons learned from this journey (as told in the sutra as a prophesy) are that short sighted greed, war and failure to protect our environment will cause kingdoms and empires to vanish. Mankind’s future depends on assuring a sustainable planet through more holistic economics, empowering communities and people, and preservation of our environment. These are the messages hidden in the Shambhala Sutra. Join me for the second journey in the Himalayan Notes series.